Hard to believe we are over halfway through the Spring semester here at Taylor University. The Writing & Editing for Gaming course is in full swing, with students hearing from some great guest speakers, submitting their tabletop game editing assignments this week, and working diligently on their final projects. Thanks again to Chaosium and Battlefield Press for providing some wonderful real world projects for the students interested in editing. The other students are all working on writing projects with hopes to publish them to the Dungeon Masters Guild. Each of these students is working on a project that could lead to self publication or products with publishers. I am excited to see their final presentations at the end of the course. When I taught this course two years ago for the first time, many of my students had minimal to no experience with roleplaying games. So, I ran two D&D 5e one-shots so the students could experience the games they were working on. 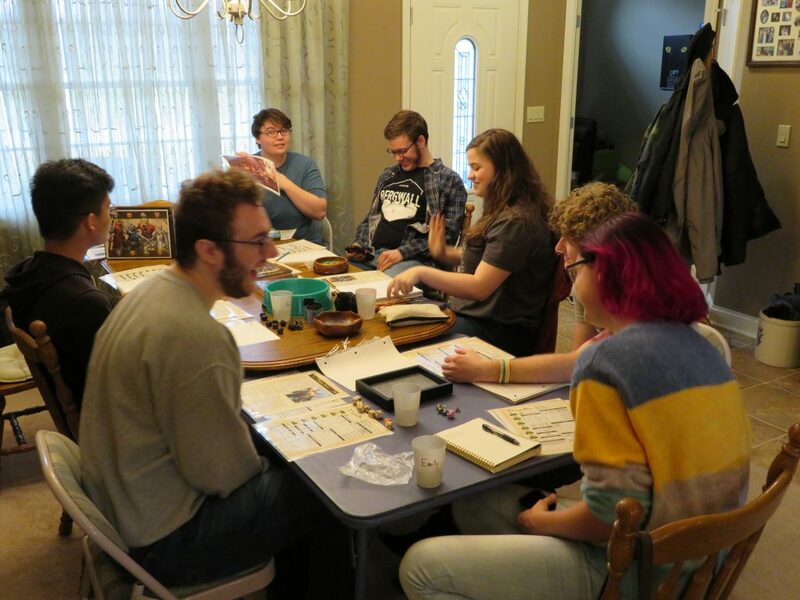 I spent time during those sessions teaching the rules of D&D 5e, describing Theater of the Mind, tips on how to DM, and the difference between modules and homebrew adventures. Things have changed in the past two years on campus, and roleplaying has become much more common. All of my current students have at least played an RPG once and many are running or playing in full campaigns. 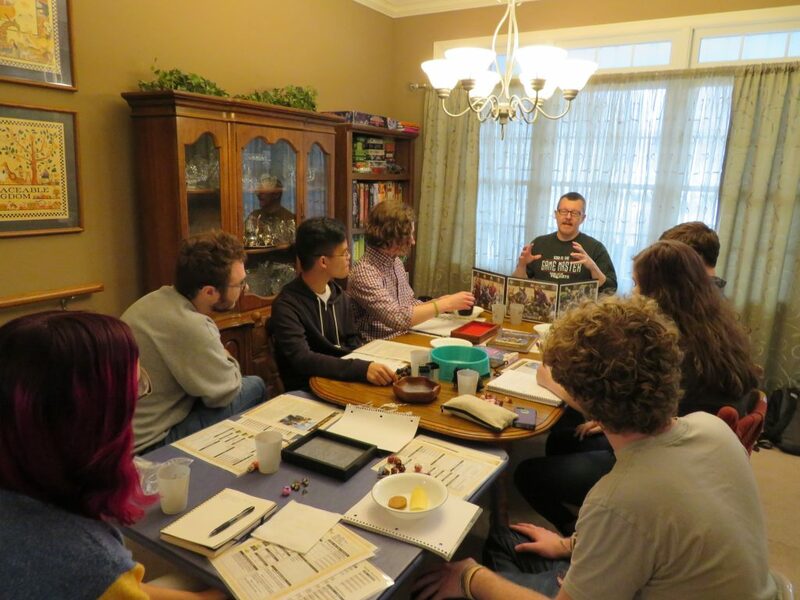 Rather than teaching an rpg this time, as my students were already familiar, the students were still interested in playing an rpg one-shot together for fun and to experience their professor as a gamemaster. So, I agreed to host a brunch and gaming at my house this past weekend. Since the seven of them who signed up had experience with D&D 5e, I decided to provide them with a different experience and ran Pugmire from Onyx Path Publishing, which is loosely based on D&D 5e and is themed around anthropomorphic dogs. The students really enjoyed getting into the character of being walking and talking dogs in a fantasy world. They had to alter a bit how they perceived themselves and the world, which was a fun challenge for them as players and me as the storyteller. To help with the ambiance of the game, I used an actual dog bowl as the Fortune Bowl and wooden dog bones as Fortune tokens. Plus, the humor came out naturally as puns, canine personalities, dramatic voices, and memes began to flow around the group. We had a wonderful time playing The Secret of Vinsen’s Tomb, which is well designed for a one-shot. My student intern even assisted by taken on the persona of one of the NPCs and helping me run the various monsters and villains. Great morning of food, fun, and fellowship. Students enjoy opportunities to get off campus and visit with faculty, and faculty seek out chances to get to know students outside of class. This brunch and one-shot Pugmire rpg session provided a unique experience for the students and myself. The more opportunities I have for running games for new people, the more I enjoy the process. Experiencing new player styles and personalities is challenging and fun, making me a better storyteller and gamemaster. Doing this for a group of students allows me to share my passion for the hobby, get to know my students outside of class, and hopefully provide them a unique gaming experience with someone who has been roleplaying for over thirty years. We have already begun to discuss with the department leadership the possibility of making this course permanently offered, thus providing a future of more incredible class discussions on working in the tabletop game industry and social opportunities like this. I am excited to see where the talent and experiences of this class of students takes them. Perhaps some will find success in the tabletop game industry.